… wait, why is there a tank? And why is it in the left lane? Something that slow should really be in the right. And I dunno about slow, it seems to be tailgating that sportscar. It’s probably California. Or Quahog, Rhode Island. 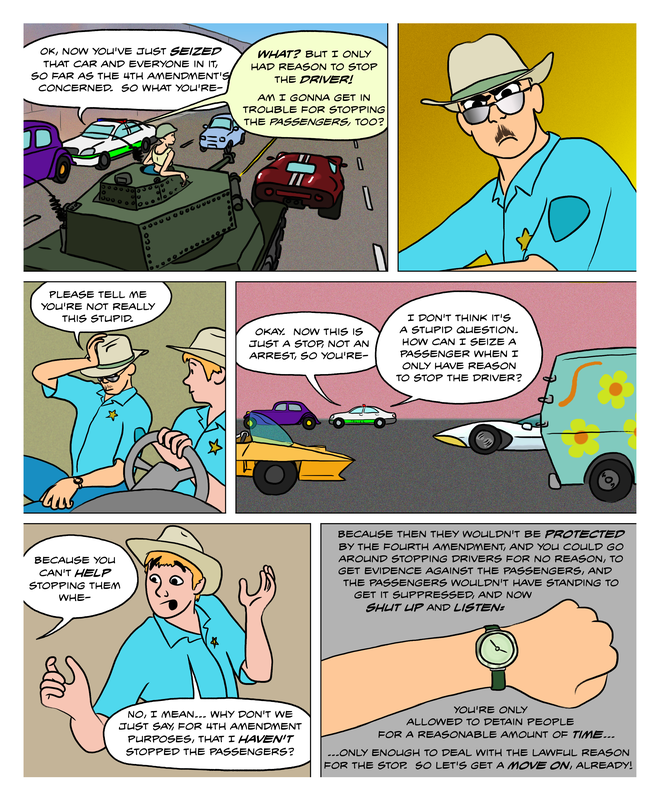 It’s obviously a hyperreal metaphor for the dystopian present, subtly but brilliantly interposed in the context of the meta-narrative of the cartoonishly simplistic illustrations that mendaciously purport to supplement the very concepts they undermine (see here: http://lawcomic.net/guide/?p=1810 for denial of racial profiling illustrated by example of racial profiling) with a notably female driver of the war-machine who has nevertheless been desexed by rendering her bald, in an embarrassingly paleo-feminist nod that only speaks to the inherent subjugation of gender, totally in line with the author’s persistently feminine personifications of law, justice, society and state. Oh my god, this is my thesis! I just hope my advisor never read Tank Girl. I just realized that one of the passengers of the tank is not wearing a seat belt. most US tanks in service IIRC max out at about 60 mph on nice roads, some can go faster. Private ownership of a tank isn’t illegal (and neither is ownership of its mounted weapons, if you have the right paperwork), you can do some searching right now and probably find a few AFV’s of one sort or another for sale. Driving it down the street might be a problem if it isn’t street-legal or if it’s disrupting traffic. And as for which lane it’s in… dude, it’s a tank. ‘The right lane’ is whichever one it wants. The tank and sport car seem to be from GTA III. And there’s the Mystery Van, of course. I see the Anthill Mob and Danger Mouse. Can’t put a name to the red or white cars atm. is…is that the mach 5? Come to think of it, that’s actually not a very stupid question by the rookie at all, and it’s one I never thought about before now. So if a vehicle is pulled over, all of the passengers are considered detained, and one of them couldn’t just get out of the car and walk away, even though there’s no probable cause to detain him? I got the Mach 5 and the Mystery Van, but can place the orange on with the bubble windshield. Fairly sure its some sort of Hanna Barbera machine. Think U.K. cartoons. Specifically for Thames TV. Hold on, *did* he stop the passengers? Would they be allowed to leave in the specific example? It seems they should be, since they had nothing to do with the illegal turn. In the last panel, he suggests that passengers wouldn’t have standing to challenge a search if they didn’t count as stopped. Would this be, for example, similar to how people don’t have standing to challenge a search if they weren’t living at a house? Because from what we’ve seen, the state doesn’t have any problems with that. The guy in the house earlier in the comic would have had standing to challenge a search if the contraband was in a bag or a pocket or something similar. It was only because the contraband was out in the open in a place where he was not considered to have privacy that he was unable to challenge the search.